Simonopetra Monastery or Simonos Petra (Greek: Σιμωνόπετρα or Σίμωνος Πέτρα) is one of the many monasteries that occupy the peninsula commonly called Mount Athos. It is dedicated to the Nativity of Christ. It is ranked thirteenth in the hierarchical order of the Mount Athos monasteries located on the peninsula. While the origins of a monastery founded by Blessed Simon the Myrrh-flowing that may have been the beginnings of the existing monastery are clouded in the mists of time, the recorded establishment of the present monastery around 1368 is credited to the Serbian prince Ioannis (Joan, Jovan) Uglješa. The monastery has through the years experienced changing fortunes as it has weathered various political and leadership issues and natural disasters. With the formation of a number of metochia during the twentieth century the monastery is weathering the latest disastrous fire of 1990. Establishment of settlements of hermits on Athos began in the later part of the first millennium. 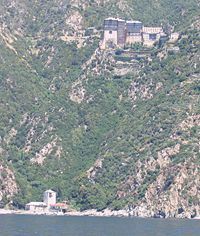 Organized monastic communities, while maintaining close relations with Athos, were restricted to the neighboring Halkidiki area. As the numbers of monks increased in the Athos area, the use of the expression "holy mountain" began to appear. This expression had been in use for many areas where sizable communities of monks grew. Formal recognition of the Athonite and neighboring coenobium communities was by Basil I in 857 who granted imperial privileges to the communities that protected the monks from tax collectors. Emperor Romanus I Lecepenus, in 941, then introduced annual grants for the monks at Athos. As the tenth century progressed further imperial support was given to anchorite communities at Athos. By the turn of the millennium Mt. Athos was a large and economically strong community with prestige and influence in Constantinople. The origins of Simonopetra monastery on Mt. Athos before Prince Ioannis Ugljesa has relied upon information in the Life of the Blessed Simon and writings of Bp. Porfiry (Porphirios) Uspensky. These discuss the existence of a "Monastery of Simon" on Mt. Athos in the tenth and eleventh centuries. Other than the paucity of information about this "Monastery of Simon" and the later note of construction of the monastery on Simon's rock little is known of the intervening years other than conjecture based upon tradition attached to the Blessed Simon and the similarity of the name. In the event a monastery of Simonopetra was completed around 1257, and the reputation of the monastery attracted many monks. In the intervening years the monastery declined until Prince Ioannis Ugljesa, impressed with the reputation of the Blessed Simon, petitioned Cyril Lucaris, Patriarch of Constantinople, to reactivate the empty monastery. With this permission, Ugljesa immediately built an entire monastery, but, after a brief period of prosperity, Athos and the monastery entered into the chaos and ruin of the ascendency of the Ottoman Turks over the area. Most records of this period were destroyed in a great fire of 1580. Yet, the monastery had functioned without interruption. On December 11, 1580, the monastery suffered total destruction by fire killing many of the monks. The survivors, however, were able to save the coffers of the monastery, which apparently were considerable as the Simonopetra monks were able to buy the assets and administration of a neighboring monastery, Xenophontos Monastery as a temporary home. As rebuilding the monastery required consideration funds, the abbot, Evyenios, journeyed to Wallachia in 1587 to raise money. Earlier in 1566, the Great Postelnik Gheorma in Wallachia had donated the Monastery of St Nicholas in the suburbs of Bucharest to Simonopetra monastery as a metochi. In the meantime the rebuilding of the monastery at Mt. Athos continued so that by 1586 the monks were back in their own monastery. On June 8, 1622, Simonopetra experienced a second fire. However, this one only caused minor damage, and by 1623, the abbot, Timotheos, dedicated the restored katholikon. After this time the monastery appeared to enter a period of decline. By 1745 the population of the monastery had decreased to five. Finally, in 1762, the monastery was closed and taken over by the central administration of Athos (the Great Mese) to satisfy its creditors. In the meantime, Fr. Ioasaph of Mytilene managed to raise enough funds to buy back the monastery's metochia and restore parts of the monastery. However, the revival was accompanied by apparent financial wrongdoings that brought Patriarch Kallinikos into assert control and eventually assign a new abbot, Dionysios. This period of chaos continued when the effects of the Greek independence movement caused the occupation of Mt. Athos by the Turks. While the monastery continued to function, the high taxation by the Turks and looting resulted in the departure of all the monks by 1823. After the Turks departed in 1830, the monastery returned to a life of constant turmoil. This turmoil continued until the destructive fire of May 27, 1891. Through the efforts of the abbot, Neophytos, and both with the cooperation and demands of the Russian Church Simonopetra was again restored and was flourishing by the turn of the century. Under the leadership of Abbot Ieronymos, Simonopetra continued to flourish. But, after his retirement to the metochi of the Ascension in Athens in 1931, the Simonopetra monastery began another decline both intellectually and spiritually. By the time of his death in 1957, the decline of monasticism on Mt. Athos, as well as Simonopetra, was well advanced as depopulation of the monasteries continued. In 1973 a rebirth began at Simonopetra when a large group of monks under the leadership of Abbot Aimilianos Vafeidis arrived from the Monastery of the Transfiguration at Meteora. Subsequently a number of metochia were established under the guidance of the monks of Simonopetra, including three in France. Again Simonopetra was faced with the destruction of monastery property by a fire that started on August 14, 1990, on Mt. Athos that lasted 14 days. This again presented a challenge for the monks. This page was last edited on May 22, 2010, at 23:17. This page has been accessed 37,715 times.